Get ready for the Goldfields Casino Poker Tournament! Are you all in? 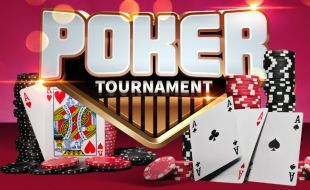 Participate in our Poker Tournament and stand a chance to win big from R2,200 a buy-in on the 23 February 2019 and R1,100 buy in on the 24 February 2019. By participating in a tournament, you agree to abide by the rules and behave in a courteous manner. A violator may be verbally warned, suspended from play for a specified length of time, or disqualified from the tournament. Chips from a disqualified participant will be removed from play. Players, whether in the hand or not, may not discuss the hands until the action is complete. Players are obligated to protect the other players in the tournament at all times. Discussing cards discarded or hand possibilities are not allowed. A penalty may be given for discussion of hands during the play. If a paid entrant is absent at the start of an event the chips will be left in place until arrival. If the player does not show the player will be blinded out. The lowest denomination of chips in play will be removed from the table when it is no longer needed in the blind or ante structure. All lower denomination chips that are of sufficient quantity for a new chip will be changed directly. All odd chips will be changed to the new lowest chip still in play. The number of players at each table will be kept reasonably balanced by the transfer of a player as needed. In all events, there is a redraw for seating when the field is reduced to one table. A player who declares all in and loses the pot, then discovers that one or more chips were hidden, is not entitled to benefit from this. That player is eliminated from the tournament if the opponent had sufficient chips to cover the hidden ones (A re-buy is okay if allowable by the rules of that event). If another deal has not yet started, the director may rule the chips belong to the opponent who won that pot, if that obviously would have happened with the chips out in plain view. If the next deal has started, the discovered chips are removed from the tournament. Showing cards from a live hand during the action injures the rights of other players still competing in an event, who wish to see contestants eliminated. A player in a multi handed pot may not show any cards during a deal. Heads-up, a player may not show any cards unless the event has only two remaining players, or is winner-take-all. If a player deliberately shows a card, the player may be penalized (but his hand will not be ruled dead). Verbally stating one’s hand during the play may be penalized. The decks are changed only at the start of a new days play or if cards are damaged. If a player is knocked out within the re-buy period by losing all their chips, the player may buy back, provided they have cash in hand. Management is not required to rule on any private deals, side bets, or redistribution of the prize pool among finalists. Private agreements by remaining players in an event regarding distribution of the prize pool are not condoned. (However, if such an agreement is made, the director has the option of ensuring that it is carried out by paying those amounts.) Any private agreement that does not include one or more active competitors is improper by definition.